So, I have to begin by saying that this is not an action-packed, jump from one moment to the next story. In fact, it actually is a slow meander to the sprint at the end, and this did make for some interesting, and not so, moments in the overall impression of the story. But, there are good moments, and those were enough to keep me reading on, interested to see just where the story would go. Griffin is a Duke, more than mildly obsessed with keeping the family reputation free from scandal and seeing his twin sister’s off on a successful debut. As is not uncommon, he was tagged with the reputation of Rake as a younger man, and was privy to some scandalous behavior with his friends, but on the whole does regret those indiscretions. Now, with his Aunt ill, the need for a chaperone to guide Sara and Vera through their debut, he needs to hire a companion. Esmerelda is the granddaughter of a Viscount, unrecognized as her mother was disowned after marrying her father, an Irish Poet. Now without support or protection, and a young sister to care for, she has parlayed her skills and social knowledge into a business that provides governesses and chaperones to the tonne. She’s a wonderfully drawn character, with a gentle yet firm demeanor and a solid sense of ‘managing one’s charges”. Sight unseen, Griffin happens to hear her dispensing this advice to one of her employees, and is determined she should work for him. And here is where things got muddled: there was a general push and prod from Griffin, despite Esmerelda’s knowing of the secret he’d prefer not surface before his sisters’ debuts, he makes no secret of the fact that he finds her attractive, and he is not above throwing money at her to gain acquiescence. And he does. Now, the story is setting up, so the interplay between these two would be reasonable, if there weren’t such a sense of insta-love on Esmerelda’s part, and the lack of convention that would be properly (and rightly) expected for the time. Then just at the point of believing that nothing will happen, the sisters are introduced, and the interactions between them and with Griffin show humor and genuine fondness, as well as a touch of Griffin’s more honorable and protective side as the old scandal threatens to rear its ugly head. But still, the back and forth with our couple, combined with a rather slow development of a real regard that seemed to overtake any action or movement forward with anything: growth, the mystery, or even the events of a debut. Contrast this rather slow pacing with the rapid increase in the rush to tie up all of the ends, some better than others, and the story was uneven, even for the setup of a new series and world. I missed the whole ‘feel’ of a historical that Grey has done so well in stories I’ve read before, and while the humor and heart of the characters did come through, the secondary players were a bit thinly drawn, and no one seemed to really be ‘of their time’. Esmerelda was a bit too modern in outlook and approach while Griffin, while sweet, reminded me of the “when I was younger, this was how we did things”, sort of person. Neither quite fit into the Regency era for behavior or custom, and I was hoping for more. A decent start for readers who prefer the sweeter and less steamy historicals, particularly if they don’t mind taking the long way round to the end. Last Night With The Duke by Amelia Grey is a well-written book. Ms Grey has provided us with an entertaining read with fabulous characters. Griffin and Esmeralda's story is a fast-paced with plenty of drama, humor and sizzle. This was a fun book to read and I applaude Ms Grey's storytelling abilities. 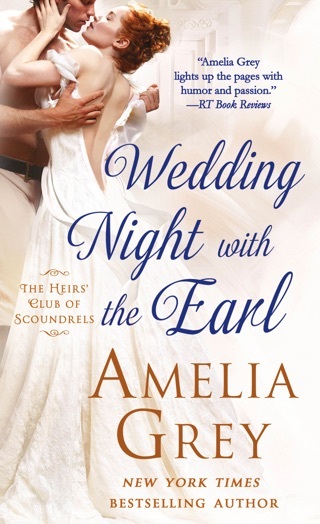 I enjoyed reading Last Night With The Duke and look forward to reading more from Amelia Grey in the future. Last Night With The Duke is book 1 of The Rakes Of St. James Series, but can be read as a standalone. This is a complete book, not a cliff-hanger. I voluntarily reviewed an Advance Reader Copy of this book that I received from NetGalley. Loved this Sweet, heartwarming and captivating, historical, romance that was a delight to read. I love it, when the words can fade away and I’m pulled into another time and place, absorbed in it. Amelia Gray has created these engaging characters that are lovable, stubborn, witty, intelligent, and have an intense attraction. Her writing manages to bring you right into the scene with the characters. Her descriptive use of language makes each scene very realistic and the emotions, the characters are feeling believable. I loved their charming, witty and argumentative conversations. I also enjoyed their easy fun and playful demeanor. They try not to succumb to their desires but they continually think of each another, but since they are not from the same class will their desires ever be attainable. Their simmering chemistry and the sexual tension is so thick you could cut it with a knife and I loved every moment of it. There was good flow throughout with an excellent build, it had drama, mystery, sweet bits of emotion and it was super entertaining with great secondary characters. This story made me laugh, sigh, and cry. I couldn’t put it down and I didn’t want it to end. Highly Recommended! Loved it can’t wait for the next in this series. I voluntarily requested an arc through the publisher and Netgalley in exchange for an honest review.